This vessel was built in the year 2000 and has a top speed of 36 knots, making her ideal for the most serious fisherman, while offering comfort and first-class amenities. It’s meticulously kept, tournament-rigged and ready for action. This Viking turns heads wherever it goes. This luxury edition has a master stateroom, with queen bed, TV, VCR and private bathroom; the guest stateroom has an upper and lower bunk arrangement, as does the forward stateroom; these two staterooms share a bathroom. Top sound system and home entertainment center, teak finish throughout with soft leather furnishings, fully air-conditioned, icemaker, Northstar GPS with color chart plotter, Furuno Radar and Video Sounder. Captain Benito Agundez has fished Cabo San Lucas for over 20 years and won the Billfish Foundation Award for most striped marlin released worldwide in 1991. His mate is Raymond. Both are bilingual. 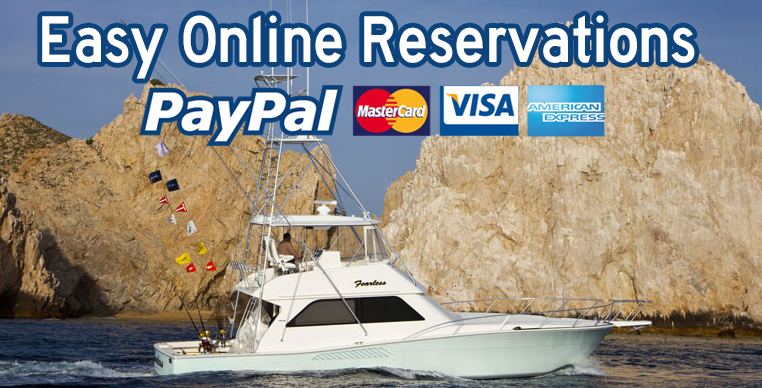 Full day charter All-Inclusive Special total $3200.00 Dlls.